The extra large puncture probe used for CE certification (European mechanical test EN388) relates to larger threats (nails, barbed wire) but is not effective in determining high-risk threats like glass slivers, metal shards, or needlesticks. 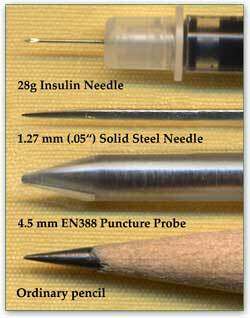 Hypodermic needles bend easily and are difficult to test. As a result, no standardized needle puncture tests exist. To demonstrate the needlestick protection of TurtleSkin Safety Gloves, we modified EN388 by using a 0.05 inch (1.27 mm) hardened steel probe that offers consistent, repeatable results, while also providing a fine tip similar to those found on many sharp objects. Warwick performs extensive lab testing on its products to ensure high levels of performance as well as consistent results. Warwick is ISO-9001:2008 certified and our on-site lab supports both product development and production certification. We also participate in independent testing, such as Europe's CE Marking and US NIJ specifications for law enforcement and corrections applications.